It's a chance to see real airplanes, remote control planes, model trains in operation and on exhibit, and classic and exotic car displays. Antique railroad maintenance equipment, train artifacts and memorabilia will be on site for guests to explore. As part of the EAA Young Eagles Program, kids ages 8-17 will be able to take free airplane flights (limited to the first 100) and Boys Scouts will have an opportunity to earn their aviation merit badge, and/or the featured annual merit badge at the event. 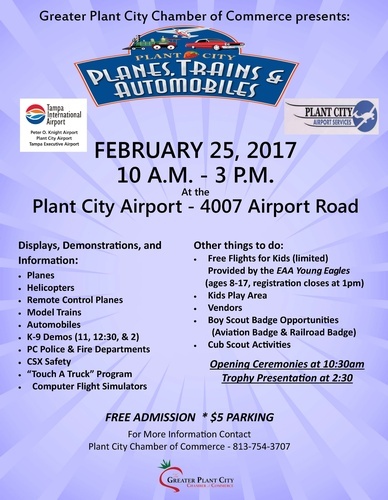 Planes, Trains & Automobiles at the Plant City Airport, 4007 Airport Rd., Plant City 33566.